My birthday was lovely, thanks for all your best wishes. I was thoroughly spoilt and really enjoyed it! My Costa Rican themed party was brilliant. I have posted several times on my Facebook page in the last few days, I consider the whole week to be my birthday week and tomorrow I have some girlfriends coming over for another get-together. I had many ‘bug themed’ presents. 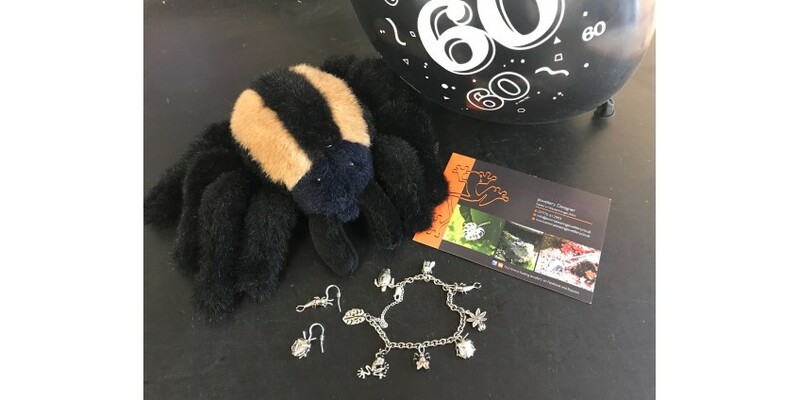 A beautiful charm bracelet and matching earrings from my hubby (amazingly crafted silver jewellery, with a vast range of bugs from Emma Keating – do look her up www.emmmakeatingjewellery.co.uk, we met Emma at the recent SEAS show in Kent), a fantastic sign for my bug room from my long-time friend Karen, a Laura Ashley blouse with bumble bees, a White Company top with Bumble bees, a pretty scarf with Bumble bees and exquisite Ted Baker Bumble bee earrings. There seems to bee a theme here (oh how I wish I could add emojis to this blog lol). Enough of my birthday (for now). I am still restocking, even though the bug room looks pretty full, I will be getting two species of Leaf insects tomorrow. Several people have asked for them so, although I have had 2 of my own hatch out from eggs. I didn’t think my customers wanted to wait for them to grow, it could take a while. I certainly have plenty of tarantulas, I spent ages feeding them all yesterday and I still need to finish that job today. You probably know by now that I like to be organised and it would stress me out to leave a job half done and move onto the next week. Where would that leave my feeding chart? I have coloured stickers for each week, this week is green, I can’t have some of my spider shelves with green stickers and then move onto the new colour tomorrow (Saturday is changeover day). I am still going forwards with my New Years resolution and devoting each Wednesday to Ginny’s Jungle. This week I have enlisted a young helper for the up and coming ‘meet the bugs’ event in our local library during half term. I think it will be a popular event and of course I can give out plenty of Ginny’s Jungle flyers. I have also made contact, with the Buckinghamshire Women’s Institute and hope to get on their list of speakers with my “Life as the Bug Lady” talk. I am continuing to cut down on some of my less popular bugs by removing them from my website. There is no point in me wasting time on creatures that just don’t sell well enough to make a profit. I think it is called streamlining, it’s not something that I find easy. My husband is always saying that I don’t prioritise and I know he is right. I take care of all my animals to the best of my ability no matter how ‘important’ they are. The trouble is that you never know what is around the corner. I decided to stop selling Headlight cockroaches before Christmas and then somebody ordered 40 adults! That order won them a reprieve but this week I decided that the Florida Woods cockroaches are not worth keeping, they will be ‘recycled’ (fed to the spiders). I am also probably going to cut out the Bean weevils, they are super food for small creatures such as spiderlings but it takes a lot of work to keep setting up new colonies. I will probably keep a colony of my own and take them off my website. Mealworms don’t really sell either but I will be keeping them, I feed them to all the birds in my garden! Mealworms do make a great teaching aid as the life cycle is fairly short and the children can see all stages of development when they buy a tub, obviously useful for school visits from Ginny’s Jungle. As usual I still have loads to say but no more time to sit here typing away with my one finger. I wish I had learned to type at school, it would have been so much more useful than many of the subjects that I did study. Latin too would have been good, a real help with all the scientific names of the bugs. Not long until Spring, I’ve lost count of the days but now that we are in February, it is only next month! – thank goodness, I hate the cold. This week’s photo: My beautiful Emma Keating jewellery.